This mystery had me hooked from the beginning. I really enjoyed the light sense of humor woven throughout. The locale descriptions put me right in the Irish countryside and drinking a pint or two along with the characters. This is a perfect “end of Summer” read. Reason 1: It has an unexpected rhythm that sometimes borders on poetic while giving a nod to film noir. Different from anything I’ve read lately. Reason 3: You, start of with your mind working against you; “Why did he do that”, “Why did he say that?”, “Where did That come from?”. As you continue reading you just let your mind relax and enjoy the ride. By the end you’re completely engrossed and wanting more! Reason 4:It’s a compact read (185 pages) that is perfect for a long weekend. I gave it 4 stars because it’s lacking a sequel! Fast-paced story, narrated with style, panache and wit. 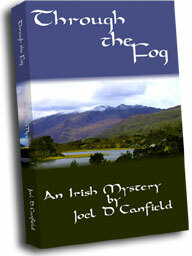 And lots of beautiful scenery and wonderful descriptions of all things Irish. I recommend enjoying it with some Guinness at reach – you will feel right there in the middle of the action. I have to admit the mysterious beginning wasn’t hooking me fully. Just enough to keep reading … and, thank goodness! A lively, wonderful romp with bad guys and a beautiful woman who might be a bad guy only we’re not sure, and an amnesiac who might be his own version of a bad guy but we’re cautiously rooting for him, not quite sure which way things are going to go. This is a perfect holiday read because you will want to hunker down and just read and read, following the twists and turns in the road and the twists and turns in the plot. I looked up at the two pairs of dress shoes, and I wondered. The grime on the window made it difficult to tell for certain, but they looked like dress shoes; both pairs. The harsh glare of the summer sun made their shine difficult to look at, even through the aforementioned grime. The feet turned and walked away, and I looked down at my own. More dress shoes. They were on an upside down plastic crate, the ones that say something about being the property of such-and-such a dairy and you’re not supposed to keep them but everyone does. The window was up high, which is why I was on the carton. The window was in a basement, which is why I was looking up at someone else’s shoes; or had been, at least. Turning my head slowly, I considered what I could see without moving: a furnace and the appurtenant ductwork; a neat stack of cardboard boxes, all the same size; a bicycle with one flat tire and one wheel entirely missing; a grubby mattress, half against the wall, half on the floor; various other basement-y things that didn’t seem to surprise me. I listened. Hard. Through the window (or so it seemed) came the infrequent sounds of a Los Angeles summer. A car drove by. Footsteps across the street (my visitors, perhaps?) An enormous flying bug of some kind buzzing against the window, then buzzing away. But nothing that sounded human, other than the footsteps, and now they were quiet. And no sounds of any kind from above me, inside the house. I decided to risk stepping down off the crate. Not a smart move, but that’s me sometimes. The car was indeed just around the corner. It was also big enough to make Dope and Pally feel right at home: a deep green 1957 Buick Roadmaster. Must have been 20 feet long and half that wide. Three linebackers could sip tea in the back seat without joggling anyone’s cucumber sandwiches off their lap. “It’s a sight, ain’t it? Should’ve seen it when the boss bought it: pink and white. Yah, pink, can you imagine? Kelly green really sets off all them acres of chromium, eh?” I was in the process of missing the chromium, being shoved into the back seat about as gently as the birth of a giraffe. Pally got in beside me, and contrary to his film noir style, did not pull a gun out of his pocket. Having taken a mental inventory of my own musculature, I figured he was still safe.